New Potato, who brought us the Jackpot Slots [App Store] game / accessory for the iPhone, has just released another such bundle for the iPhone and iPod touch — but this time around, the game in question is pinball. 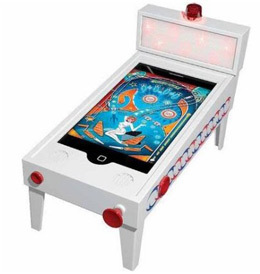 Pinball Magic is a gaming accessory that is intended to transform your iPhone or iPod touch into a realistic pinball machine, albeit a rather diminutive one. 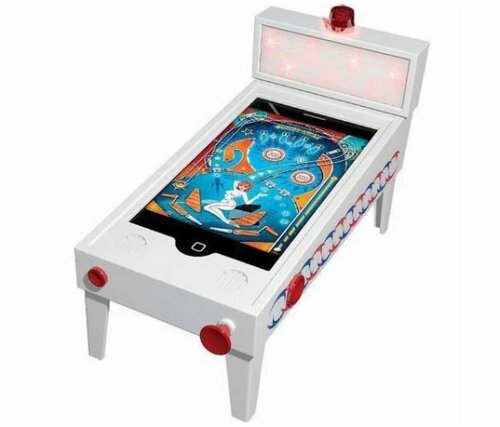 The pinball table-shaped accessory sports flipper buttons, a ball-launching plunger, a credit / select button,an animated LED backbox display, and foldable legs for easy transport. The device mates with your device’s 30-pin dock connector and delivers a pinball experience by way of New Potato’s free Pinball Magic [link] app. Pinball Magic is currently available from Best Buy, online and at certain retail locations at a price of $39.99. And don’t bother downloading the game app if you don’t have the accessory — it won’t play at all.